Whenever I have a job that takes me somewhere different, I always make an effort to spend a few extra days on location and photograph something for myself. Creating personal work keeps my mind refreshed and allows me to pursue creative avenues not always available on commissioned projects either due to timing, budget, creative direction, or brand guidelines. I had finished working on the Island Hopping project for the tourism bureau and wanted to photograph a story about people who called Siargao home. Siargao (pronounced like this) is famous in the international surf scene - a hidden gem known for its quality waves and being friendly of the wallet. However there is something special about Siargao, that turns many visitors into full-time residents. I wanted to focus my story on people who had moved to Siargao recently. With only one day before I had to fly out I had a lot to get done, namely find a subject willing to be photographed and an interesting location to do it in. As I was having my breakfast, I quickly mentioned my idea to my barista, Lillia, and in a serendipitous moment she said, "I moved here from Germany to surf, you can photograph me if you want.” As if that wasn’t enough, a table away, Pia who overheard our exchange, chimed in, “I moved here from the US, and I'm a surf model, you can photograph me too.” Casting sorted. I envisioned a location that would emphasize the remoteness and unspoilt beauty of Siargao. With no time to scout, I asked Lillia & Pia to describe the surf areas within an hour of the hotel I was staying at. They had piqued my interest when they described Giwan - “a small white sand beach, accessible only by a 20 minute hike through a jungle foot-path.” With my subjects and location sorted, we agreed to meet up a few hours later to head to Giwan together. The winding footpath was unpaved and narrow, contoured by the tangled ferns and towering coconut trees. At some points it was only wide enough accommodate a single person. It seemed to go on forever, the beach was hidden from view and the sound of the water barely audible over the cacophony of the jungle. With nothing but their boards and bikinis, the ladies walking barefoot made their way to the beach. When we arrived at the beach, Lilly pulled out some wax and and prepped her board. We got to chatting and they shared a little about their lives with me. Lillia was born Kazakhstan and raised in Germany, where she grew up to become an ICU nurse. However she found the lifestyle very stressful and in 2014, took a sabaticcal to travel around the world. It was on this trip she first visited Siargao. A year later she decided to quit her job, pack up her life and move to Siargao to learn to surf. She did all this without knowing the language or having any local contacts. I asked her why she chose Siargao. She answered, "Siargao along with the Cook Islands were among the favourite places that I had travelled to." But what set Siargao apart and cemented her decision to move here was the people. Their easy going vibe, welcoming nature, infectious smiles, and generous hospitality made her feel right at home. She has called Siargao home for the past 2 years, and plans to stay for the foreseeable future. 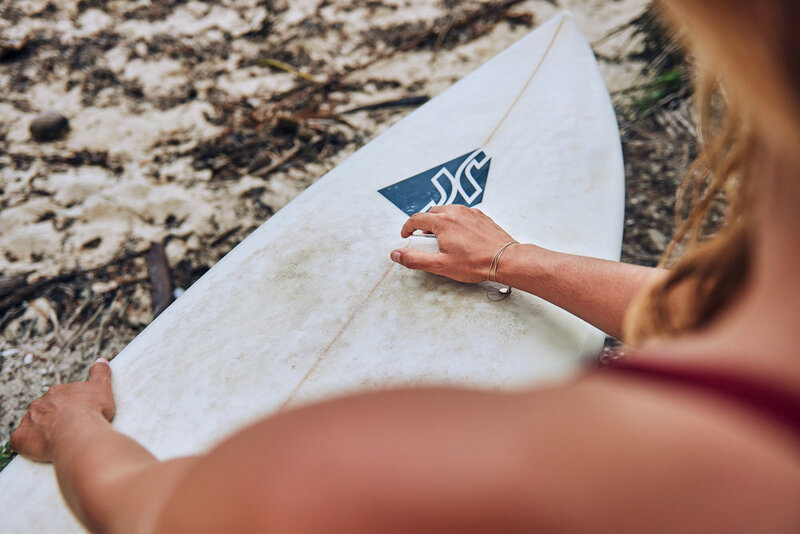 Lilly works as a barista a few hours each morning at the local espresso bar, leaving the rest of the day for her to surf, explore, and enjoy the island lifestyle, a far cry from the stresses of the intensive care ward. Pia split her time growing up on her mothers farm in Virginia and the Philippines with her father. After finishing university in Colorado and working in Hawaii for a non-profit Pia still felt something was missing in her life, she was restless and unfulfilled. She wanted to live a life where she could blend her passion for community service, surfing, travel, and reconnect with her culture. After visiting friends in Siargao she found herself returning more often and for longer periods of time. She finally decided to make the permanent move in the spring of 2017. She works as a mentor to children, teaching them the joys of surfing and instilling the values of marine protection, preservation, community service alongside modelling and being a spokesperson for local surf companies. As the sun started to dip and the waves died down we decided to call it a day and head back into town. I had an early flight the next morning to catch. Not bad for something I planned out over breakfast.